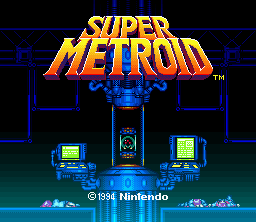 Super Metroid is the third game in the Metroid series, released for the SNES in 1994. Currently, it is the most widely-hacked Metroid game, and has the most resources available to help hackers. All information here relates to the specific unheaderedROM: “Super Metroid (JU) [! ].smc”, which should be 3,145,728 bytes in size and have CRC D63ED5F8, sha1sum DA957F0D63D14CB441D215462904C4FA8519C613, and md5sum 21f3e98df4780ee1c667b84e57d88675; if your rom has a different checksum, then it is not a clean unheadered vanilla ROM, and you should try to acquire a new one. If you do not know how to verify your ROM's checksum, try opening the ROM in snes9x or use something like QuickHash or Microsoft's Checksum Tool. For information related to patching this ROM please check Patching a ROM or The HOWTO on the main site. For editing Super Metroid, SMILE 2.5 is the primary tool used; a more updated version Parlor is available, but is unstable. Most information here will be with 2.5. SMILE has two derivatives currently in production, SMILE JX created by JAM and SMILE RF by Scyzer. Various tools exist for Super Metroid editing, including but not limited to Projectiler and DopeTool, these tools are useful to creating the perfect ROM hack. SMILE Parlor - The latest version of SMILE, but unstable, differences between 2.5 are mentioned here, as well as anything new. SMILE JX - SMILE JX, created by JAM, based off the Parlor source code. These guides cover all the basic things around editing Metroid, as well as serving as a good starting point for learning how to get into Metroid hacking! FAQ - Frequently answered questions here, if you got a problem, this might have the answer! Utilizing the BANG enemy - A guide to creatively utilizing the BANG enemy. These guides assume you have a good basic knowledge about editing Super Metroid already, you should probably be comfortable with using SMILE by now and be moving onto using tools like a hex editor. Cloning New Enemies - A guide to cloning enemies to create your own enemies without overwriting any of the old ones. Cloning New Rooms - A guide to cloning rooms in order to expand your hack. Room Expansion - A writeup about expanding your room's level data so you can make more complex rooms! Changing Which Boss Starts The Escape Sequence - A guide to get any boss to start the escape sequence, includes an example bit of assembly for you to modify. Message Boxes - Editing message boxes, item names, etc. Credits Editor - SMILE RF's Credits Editor: the basics, and what NOT to do! List of Potentially Useful BTS Blocks for Hacks - Curious about some of the lesser known block types that Super Metroid hides? Look no further! Writing new music - A guide to writing new music in Super Metroid, includes an example. ASM stylesheet - Some tips to organize your ASM code and optimize your workflow when disassembling routines in SM. Beam Editing Guide - How to find and edit various aspects of beams. This segment is reserved for technical information on Super Metroid, to be used as reference material for hackers, or for the curious wanting to know what makes Samus tick, or possibly you are interested in making a fan game and want to know how Super Metroid does things! Data maps of ARAM, VRAM, RAM, and ROM are here. ARAM Map - A map of Audio RAM. ROM Map - ROM map of Super Metroid, needs double checking however. Not to be confused with a disassembly. RAM Map - RAM map of Super Metroid, incomplete. List of Enemies in Super Metroid - A list of all known Super Metroid enemies within the ROM. Technical Information on Enemies in Super Metroid - A technical list of all known Super Metroid enemies within the ROM. List of Tilesets - A list detailing the default contents and area of tilesets within the game. List of Music - Another list that shows useable music collection and play combinations which can be used to set the music in a room. Room Associated Data and It's Format - All the data dealing with room headers/IDs broken down for your understanding. Library Index An overview of disassembled code by various dedicated hackers.